THE PBRA PROVIDES UV Resurface Solutions for all your refinishing needs. The Bathtub Refinishing industry has been searching for UV Resurfacing Solutions for almost two years. This has been a topic of man heated debates. Some negative that serve no purpose other than to demonstrate their inability to cope with new technology and to flood the internet with their mindless scrawling in a subversive attempt to protect their conventional outdated techniques and lagging product sales. Others choose the moral high ground have actually put some work into their investigations. Without a doubt the most proactive efforts and the most pronounced break through and successes have been put for and accomplished by the Original Professional Bathtub Refinishers Association as evident by the facts noted in the balance of this blog. After many years of research and development with the leading UV coating developer the original Professional Bathtub Refinishing Association America and Canada has been recognized by many prominent uv coating and uv lighting companies in the UV refinishing industry. 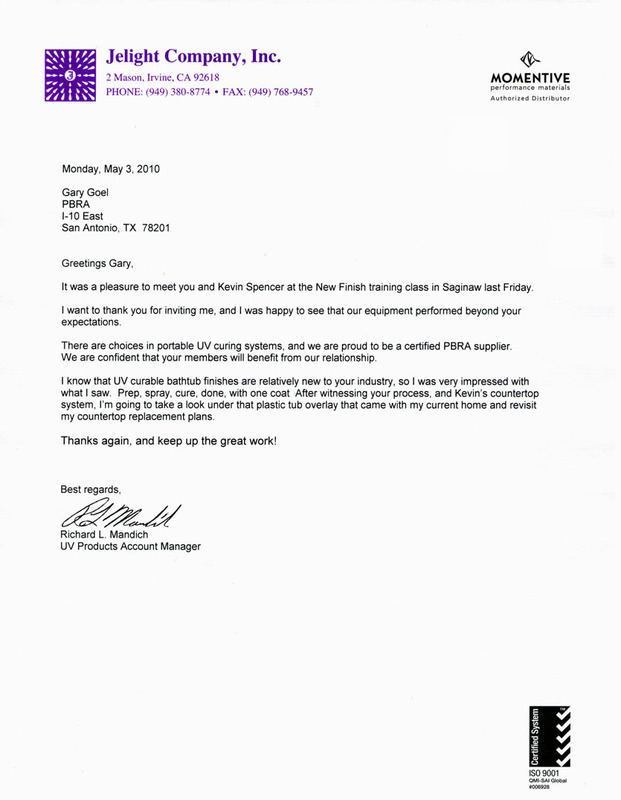 The PBRA have indeed solved the issue and found many UV Resurfacing Solutions to finally end this debate. SEE VIDEO We were surprised and honored to learn a recent nomination on our behalf was put forth by a Radtech.org member. The 2010 RadTech Emerging Applications Awards will be presented at the upcoming RadTech UV/EB Technology Expo & Conference 2010, May 23-267, 2010, Baltimore, MD. Award nominees must be end users of UV and/or EB technology. Marketing Director Adastra Technologies, Inc.